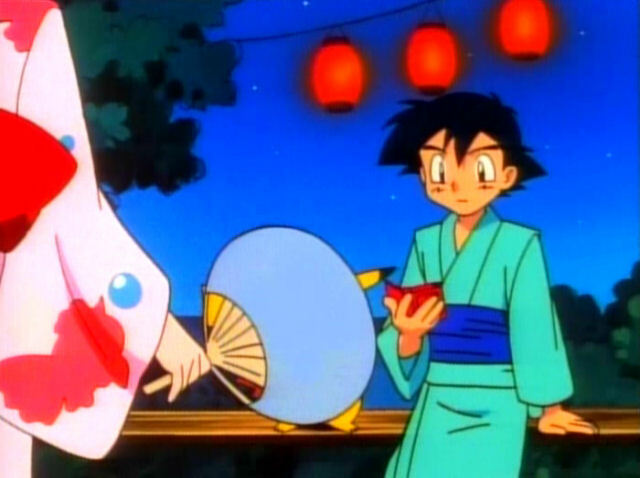 Japanese Episode 020: "Spirit Pokemon and the Summer Festival"
American Episode 019: "The Ghost of Maiden's Peak"
Our heroes have arrived at Maiden's Peak where a festival is taking place! Takeshi is upset, however, because the summer has come and gone and he still hasn't found himself a girlfriend. Suddenly, a beautiful young woman appears before Takeshi and then vanishes in an instant. Later, at a shrine in the area, a Shinto priest unveils a painting of the woman Takeshi had seen and tells the gathered crowd that the woman perished over 2000 years ago. The young maiden had been waiting on a cliff for her beloved to return, but he never did. Moved by the young woman's dedication, Takeshi decides to stay up at the shrine all night to think things over. Eventually, it is revealed that the ghost of the maiden is haunting the area, so Satoshi and his friends buy some anti-ghost charms to keep the ghost at bay. 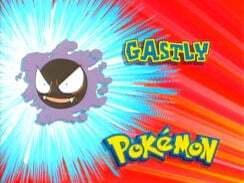 Later that night, the phantom returns and reveals itself to be the ghost-type pokemon, Ghos! Satoshi-tachi attempt to battle it with their pokemon, but Ghos is able to easily claim victory. Eventually, the morning sun comes, causing Ghos to retreat. Before it leaves, however, it tells everyone not to forget about the maiden. As the summer festival comes to a close, our heroes celebrate the end of the season before preparing for Satoshi's next Gym Battle. 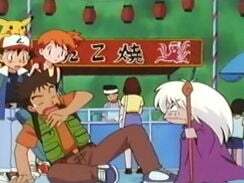 Remember when this show was allowed to be Japanese? I sure do. I remember episodes like this one, where Japanese characters could go around and be Japanese without worrying about what the people on the other side of the Pacific think. And why the hell not? American cartoon characters get to be unapologetically American, so why should Japan be any different with their cartoons? Unfortunately, episodes that show these Japanese children actually be Japanese (like this one) would soon become all but extinct. 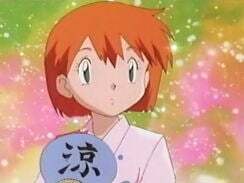 The anime producers started to become too worried about how the rest of the world would look at their show, so they gradually started to replace the extremely Japanese characters who appear in episodes like this one with bland, sterilized versions of themselves that desperately tries to hide their country of origin. 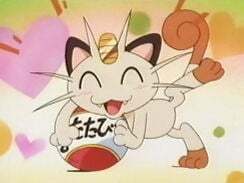 Satoshi goes from a boy who loves noodles and various Japanese dishes to a kid who likes hamburgers and hot dogs, and most of the other characters go through a similar transformation. It's really quite heartbreaking to see the anime producers seem ashamed of their culture..
That's why I like episodes like this one. It reminds me of a time when the show could just be itself instead of what it thinks the rest of the world wants it to be. Ignoring all that for a second, though, this episode is really, really good. We get to see Takeshi and Kojirou fall over a woman (one of the only times we see Kojirou do so), we get a neat presentation of the Rocket-Dan's motto, and we get a lot of stuff about ghosts and dead people that we usually don't get in a show like this. Having Ghos be one of the first pokemon (outside of Nyarth, of course) capable to communicating with humans is neat - if a bit random - is also a nice twist. And how about that pokemon fusion thing, huh? How come we still don't have anything like that in the games in this day and age? Even though Fushigix ("Venustoise" in the dub) is kind of lame looking - it's just Kamex with a tree poking out the back of its head! - it would really be neat if Game Freak could incorporate something like this into future game installments. The festival shown in this episode is actually the Bon Festival, which is kind of like Japan's answer to Mexico's Day of the Dead. Read through the Wikipedia page I linked to and then rewatch the episode to see how much more sense it all makes. The dub tries to cover up the Japanese culture in this episode, but this ends up being one of their less convincing cover-ups of their entire run. This one also has the I-can't-believe-the-censors-let-him-say-that "bathing suits...and girls to wear them!" line as well as the yen-to-penny cover-up, so that's kind of neat. Other than that, though, we get a lot more of the same, really. 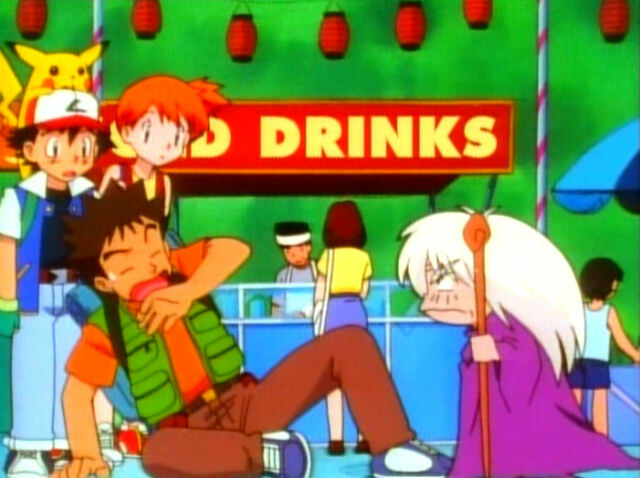 The dub adds all this dialogue about Brock and the others wanting to ride a ferris wheel and eat corndogs and cotton candy, making the whole Bon Festival seem like a state fair or something. None of this is in the Japanese version at all. This is kind of funny because during the establishing shots of the festival (after Kojirou sees the maiden), we hear a voice that suspiciously sounds like Misty's saying "Let's go on the ferris wheel!" Twice. It's seriously one of 4Kids' saddest attempts at hiding a culture that I've ever seen. "No, you guys...really! This show isn't Japanese! I PROMISE!!" 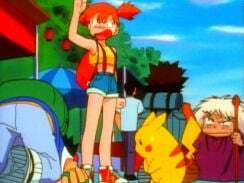 The red stand beside the Purin balloon says yakisoba, while the red banner beside the Zubat says "candy apples." I can't really make out what the banner below the Purin balloon says, though. The sign in the Japanese version says takoyaki. I also love the little drawing of the octopus just chillin' on the right side over there. 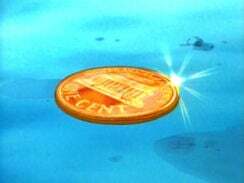 The Japanese coin is five yen, which is roughly equal to about five cents. Oddly enough, the shot of all the Japanese money inside the old woman's cash register later in the episode doesn't get altered at all. Weird. When the ghost of the maiden is walking around, the Japanese version plays the music from Shion Town, updated for the anime. This is the only episode that the music is used in (to my knowledge) and is Track 031 on the OST, 眩惑の美女 ("The Dazzling Beauty"). The dub replaces it with some of their stock music that we'll hear a few more hundred times throughout the series, which is really, really annoying when you think about it. I think it's safe to assume that you guys know that those aren't stickers, right? Those strips of paper are called ofuda, and they're used to repel ghost spirits by placing them on the bodies (specifically, the foreheads) of people who are being terrorized by dark spirits. Scrolls would have worked just fine (I think that's what the Sailor Moon dub ended up doing), but I guess 4Kids decided that giving these ghost exorcisers the same name as something you can buy for 25 cents on the way into Wal-Mart was much better. 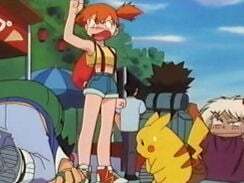 Brock: "Hey! Let me go!" Takeshi isn't upset in the Japanese version; instead, he exclaims "You guys...!" before being pulled back down. Kind of like he just snapped out of some spell and is just recognizing his friends. 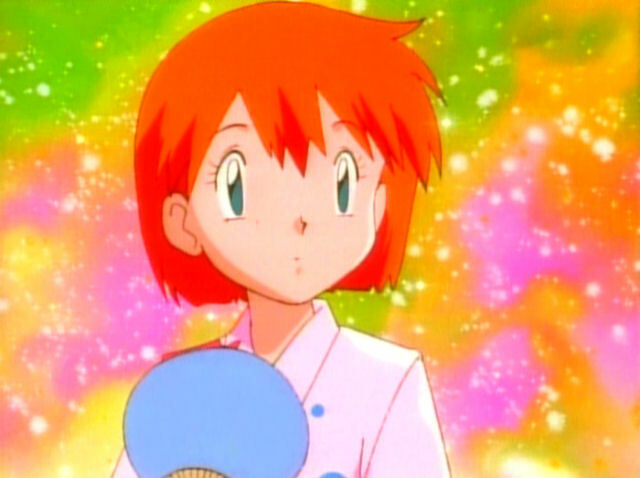 Jessie: "Hey girl! You can't take him! You haven't got a ghost of a chance!" The lameness of this line has already been covered by somebody else, so I'll just say that this and the two "ghastly" pun later in the episode are really, really unnecessary. 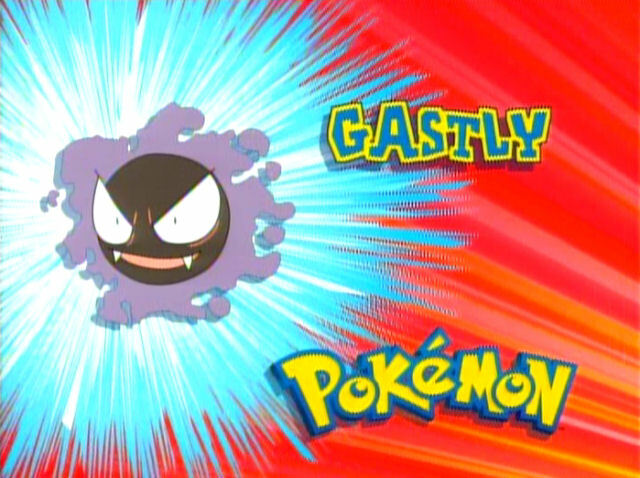 Ash: "Well Gastly! Time for a battle!" In the Japanese version, Satoshi tells Ghos that since it's a pokemon, he can battle it using his pokemon. Which is a line I like a lot better than the "grrr...let's fight!" thing we get in the dub. The ball that Ghos makes for Nyarth to play with has matatabi ("catnip") written in hiragana. It’s taken off by the magic of digital paint. Oddly enough, the fire extinguisher Ghos creates to scare Hitokage keeps the kanji it has on it ("fire extinguisher") in the dub. 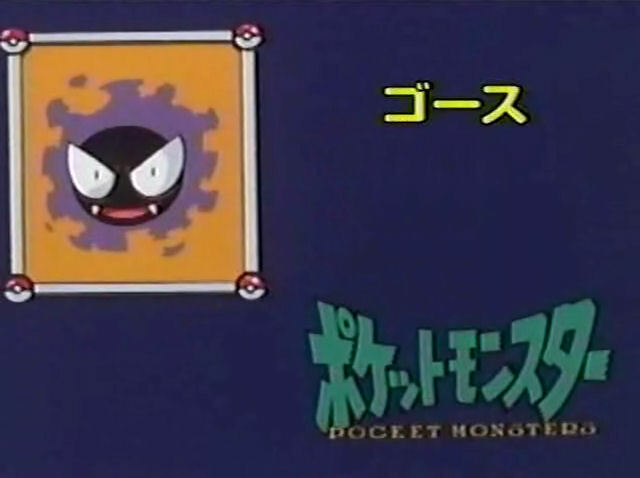 The mongoose that Ghos calls forth to scare Arbo doesn’t say “Dinner Time” in the Japanese version the way it does in the dub; it just says “Mongoose~!,” as if it were a pokemon. This was waaaay before Zangoose, you have to remember, so having a real world animal showing up like this is kind of a necessary evil. Also...is anyone else surprised that Kasumi gets to hold up a Christian cross without it being censored at all? 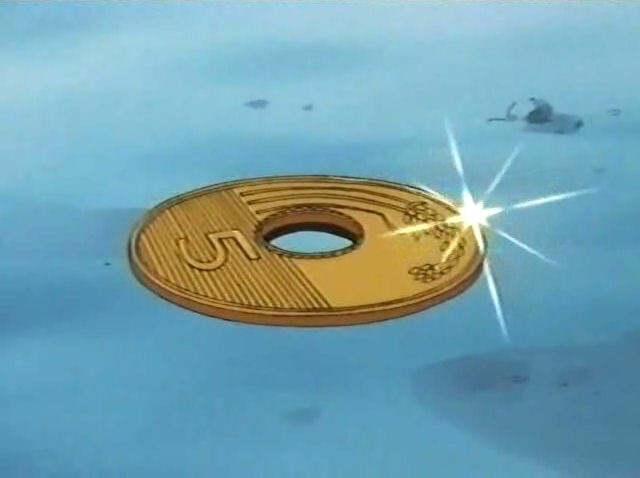 Later, we see a scene depicting Tourou Nagashi. 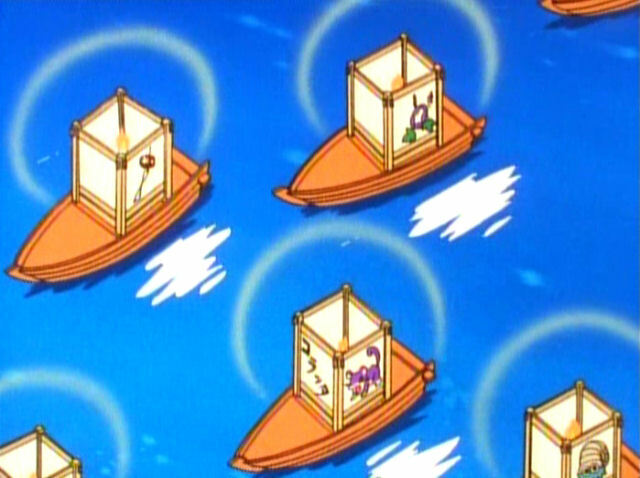 During this scene, we get this shot with a) katakana that's been left in (it says Koratta, by the way) and b) a boat with something that appears to be a Chiriin. 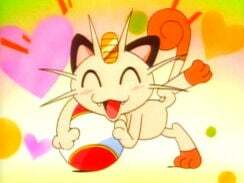 As in the third generation pokemon. What that actually is, from what I can see, is just a regular ol' Japanese-style windchime (called furin). Chiriin is based on a windchime, after all, so the mistake is an easy one to make. Japanese windchimes are kind of a symbol of summer, so that's probably why it's included during this summertime festival. This page has a lot of neat information about furin that you might find interesting. During the final scene of the festival, the Japanese version has a version of Pokemon Ondo playing in the background. It’s not the version that will eventually be used as the series' ending theme but a completely different composition sung by Ishizuka Unshou. To my knowledge, this version is never used in another episode and has never been released on CD. The dub takes out the song, leaving only the sounds of Musashi's and Kojirou's drumming. When we first see Kasumi in her yukata, she’s holding a fan with the kanji for suzu (as in suzushii, or “cool” in English) on it. 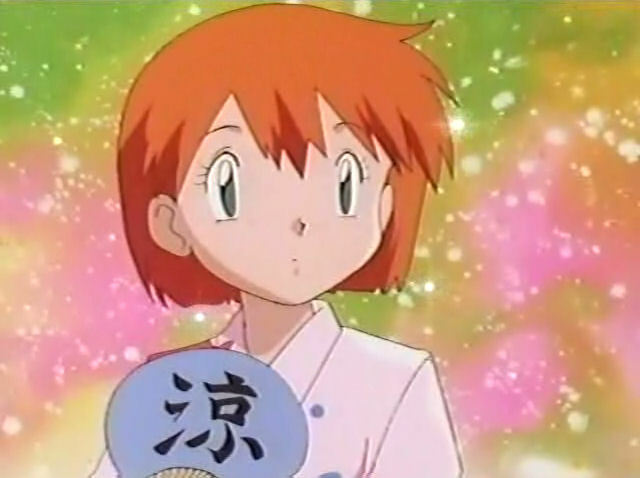 The fan Misty’s holding has the kanji erased. You remember how I called the matoi paint edit in "Here Comes The Squirtle Squad" a case of 4Kids "missing the forest for the tree?" Because I think the exact same thing can be said about this one. I mean...look at the big picture here. 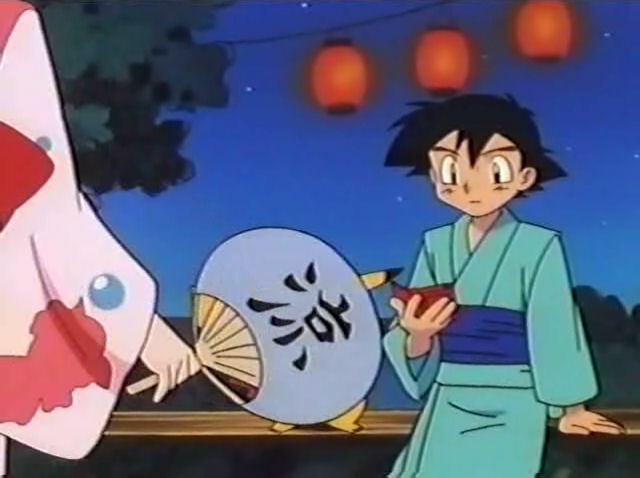 Both Satoshi and Kasumi are wearing yukata during an bon festival as paper lanterns hang in the background. Just a few shots earlier, we see Musashi and Kojirou beating on a taiko drum atop a yagura. Later during the same scene, we see all of the main characters doing the bon odori. While no one can reasonably expect your average American to know any of these terms I just spouted off, I think it's pretty safe to say that most fans watch this episode and knew that this show came from Japan and that these characters were doing something Japanese. Yet 4Kids erases the kanji on Kasumi's fan to hide the fact that this show comes from the land of the rising sun.